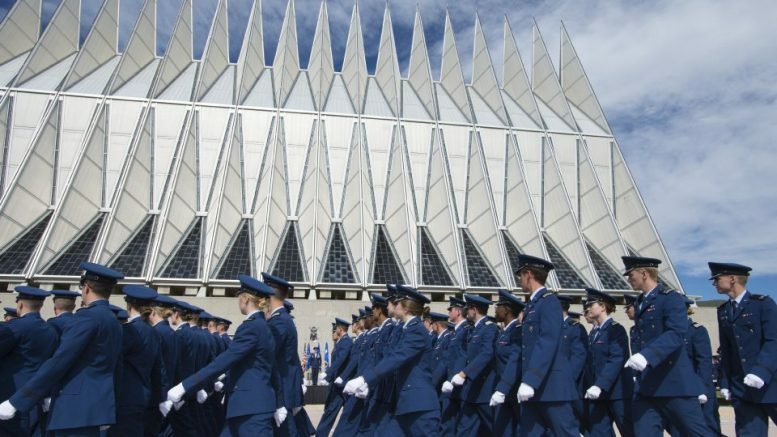 Cheating by more than a dozen freshman cadets on a test and alleged misconduct by members of the lacrosse team are under separate investigations at the Air Force Academy, according to the Colorado Springs Gazette. Herritage went on to say he couldn’t divulge any further details because the investigation is ongoing. Herritage also wouldn’t divulge more information on the investigation into the lacrosse team, but he did confirm an investigation into the team indeed was underway. After a 2014 Gazette investigation revealed misconduct by academy athletes, the school undertook an internal investigation and redoubled efforts to ensure it was recruiting players who would avoid trouble. Last summer, then-Superintendent Lt. Gen. Michelle Johnson said the academy had put its athlete-conduct woes behind it. “Now they are our shining stars,” she said in July. 4 Comments on "Air Force Academy Probes Alleged Cheating, Misconduct"
I came to gloat over the hate crime finding at USAFA, that the victims had perpetrated against themselves, but to your credit you don’t have anything on this on your site. Were you waiting for the outcome of the investigation or unaware? Will you post this news from either CNN or FOX? Your choice, okay? Racist messages written on message boards posted to the doors of five black cadets at the U.S. Air Force Academy Preparatory School in September were written by an African-American cadet who was an alleged “victim.” The school says its investigation of the incident is now closed and the responsible cadet has been dismissed. According to the report, “what happened to trigger the investigation hasn’t been disclosed,” but a News Channel 13 report says that the investigation deals with “hazing, bullying, abusive sexual contact, and drug use” on the team.